Firstly may I take this opportunity on behalf of Cirencester Car Club to thank everyone involved with yesterday’s event. It never ceases to amaze me at the numbers of volunteers that turn up on the day from many other clubs (the rally family) to help us run the Corinium Stages. My personal thanks must go to the small organising team, who along with the Corinium Stages have, or are working on four major events for the club in the first half of this year alone. Two weeks before the event entries stood at just 28, a very brave decision to run was taken and proved to be correct, whilst we are obviously disappointed that another rally, the Welsh was cancelled, the benefit to the Corinium Stages was enough late entries to just break even. The Corinium Stages always extends a warm welcome to any competitors in any car and we let the stages decide the many class and the overall winners. A big thank you to our sponsor, Jeremy Wells & Wells Masonry, for your kind support of our event. Jeremy’s help also extended too many long hours at the Airfield along with the organising team during set up and clear up. 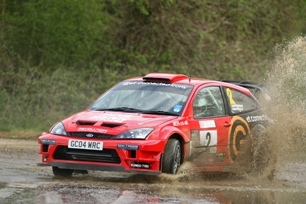 Congratulations to Damian Cole & James Morgan worthy winners of the 2012 Corinium Stages in their Ford Focus WRC. Down Ampney witnessed one of the closest contests in many years, with Damian, Martin England and Gary Le Coaudou going head to head, fighting for seconds over the first few stages, unfortunately mechanical issues for both Martin & Gary robbed of us of the titanic battle between them and allowed Damian and James a comfortable victory on their first visit to the venue, testing in preparation for next weeks Manx rally. Finally everyone, it was a pleasure to Clerk the event and take on the challenges that the event always presents. We are a friendly club trying to provide an event that we would all like to take part in ourselves and it was very rewarding working with you all. May I take this opportunity on behalf of Cirencester Car Club to thank everyone involved with yesterday’s event. Congratulations to Martyn & Ian England on a convincing victory in the main rally, and to Chris Ingram & Michael Gilbey on a very close fought victory in the Junior Rally. My personal thanks must go to the organising team. A completely new team to the one that ran last years Corinium Stages and one that has pulled together the event in a relatively short time. This was done under demanding circumstances and only two weeks after our club organised the Corinium Economy Run, the clubs second major event of 2011. A massive thank you to all the non-club officials & marshals, all from local clubs (The Rally Family), for whom without their help it would just not be possible to run the event. The future of rallying at Down Ampney looks uncertain at the moment and the local clubs of Cheltenham, Cirencester and Emcos are working closely together to keep events going as long as the venue is available. Also a mention for Dave Cooper, Chairman of the Cotswold Motor Sport Group, for overseeing negotiations at the venue. A big thank you to our sponsor, Jeremy Wells & Wells Masonry, for your kind support of our event. To the competing crews a big thank you for some safe driving, only two bales damaged and a very clean service area after you all departed yesterday. I must mention the Junior rally, a big thank you to the crews for the competitive driving and conduct that some of the wider rallying community could learn from. The Junior organisers are installing good manners and etiquette and this was evident in the crews. Keep it up and it will stand you in good stead for the future. To everyone, it was a pleasure to Clerk the event and take on the challenges that the event presented. We are a friendly club trying to provide an event that we would all like to take part in ourselves and it was very rewarding working with you. A week ago the Cirencester Car Club and the Ltd company had a massive decision to make, with only thirty entries and facing a large deficit, Yesterday proved that the right decision was made and a new event is firmly on the calendar. 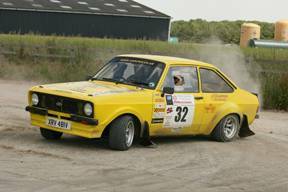 Congratulations to Jim Munden & Andy Frost on a surprise final stage victory. Commiserations to Spencer Chard & Dale Lovegrove, I greeted this pair at the final passage control and to see the despondent looks on their faces said it all, admission of missing a spit and losing an event that they had led for most of the day. Guys your speed on the day will surly bag you a win very soon. A massive thank you to all the non club officials, all of whom adjusted their normal fees to help reduce the rally deficient, your generosity has been noted and is proof of how strong and loyal the local rallying community is. I have been involved in Rallying at Down Ampney for close on 30 years, in all that time I have never seen the local clubs work so closely together, I have always been an advocate of clubs not standing on each others toes, this is a credit to you all and to Dave Cooper, Chairman of the Cotswold Motor Sport Group for overseeing negotiations at the venue. A big thank you to our sponsor Jeremy Wells & Wells Masonry for your kind support of our event. Our club is extremely fortunate to have one of the youngest club secretaries in the Country Melanie Holmes, she rose above that challenge yesterday and took on the Corinium Stages as well!! Finally to Mark Holmes who’s delicate negotiations with Cheltenham, Emcos and the land owner have secured another event at Down Ampney, this can only be good for the venue’s future as the agreement between all the clubs is for continued investment in repairs & equipment. Mark and his family have been the back bone of this event, I hope your investment of time has been worth while with such a cracking event.